Although USS Constitution underwent several periods of repair and rebuilding in her long career, her first true restoration took place in 1906 when a very modest sum of $100,000 was allocated by the U.S. Congress in that year’s naval appropriation bill. Naval Constructor Elliot Snow oversaw the work, which began in the summer of 1906 and was completed by August 1907. In that one year of work, Constitution was transformed from her days as a receiving ship to the appearance of an early 19th century sailing warship. This restoration, which was primarily cosmetic, included the removal of the enormous barn-like structure, the installation of a sailing rig, and the opening of the waist bulwarks. Added to the list of work accomplished was the casting of 54 guns for the spar and guns decks, thereby re-establishing an armament aboard (even if fake) for the first time in nearly 30 years. It’s not quite clear to us today how Naval Constructor Snow determined the gun pattern for the spar and gun deck batteries. Snow’s purported research lead him to believe that there was no documentation left regarding Constitution‘s War of 1812 armament. Based on the guns that he ordered cast in the Charlestown Navy Yard in 1906, we think he instead relied on information from Louis Tousard’s late 18th-century treatise American Artillerist’s Companion and used a French pattern. An illustration from Louis Tousard’s American Artillerist’s Companion, printed in the late 18th century. The 24-pounder is the second gun from the right. Snow may have referred to this illustration when designing the gun patterns. 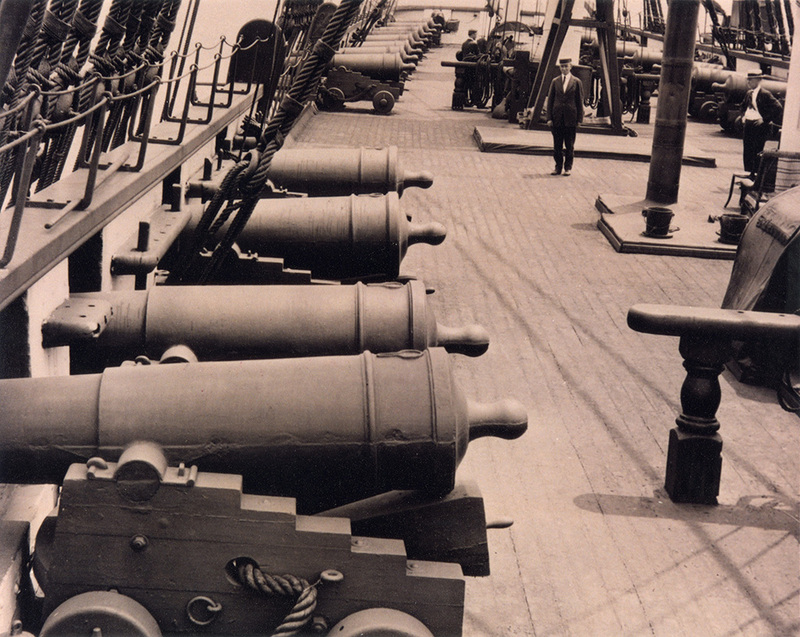 Snow understood the difference between short-barreled carronades typically found on warships’ upper decks and long-barreled, heavier guns found on the lower gun decks. Yet, when it came time to make the decision on Constitution‘s replica battery in 1906, the 54 guns were identical in pattern regardless of where they were to be placed on the ship. Even more perplexing, the spar deck guns were made approximately 8 inches longer than the gun deck guns. It has been speculated that the matching gun patterns were chosen as a cost-saving measure, but the difference in length makes this seem implausible. The French pattern guns remained on the ship for 20 years following the 1906 restoration. Lord had conducted his own research and came to the inaccurate conclusion that Constitution was originally outfitted with English guns in 1797. It turns out his guns, which were installed on the ship at the end of the restoration, were no more correct than Snow’s French pattern 1906 guns. Today, we know that at least 33 of the 1906 replica guns were dispersed across the United States and many now decorate courtyards, college campuses, cemeteries, and parks around the nation. Below is a list of locations where we know the guns exist today or have existed in the past, and we are constantly on the lookout for more. Have you seen a USS Constitution 1906 replica gun somewhere? Let us know! Approximately 14 guns in 10 locations throughout eastern Massachusetts (see map below). 2 guns on the University of Maine, Orono campus. 1 gun purchased in 1928 by Peter A. Leinenger and originally displayed at the Schoharie Central School. The gun is now placed at Old Stone Fort. 1 gun given to Newport c.1930 and originally placed at a local beach. It was moved to Fort Adams State Park sometime c. 1996. 2 guns at the Nemours Mansion, Alfred I. DuPont Institute. 2 guns were transferred from the Charlestown Navy Yard to the gates of the football field of the United States Naval Academy in the summer of 2008. 1 gun donated to the City Municipal Building in 1933. 2 guns at the Fountain of Youth Park. 1 gun originally installed next to the city library and dedicated in 1933 by the Daughters of the American Revolution Lake Wales Chapter. The gun is now located outside the Lake Wales Depot Museum and was rededicated by the DAR on October 21, 2012. A 1933 article from a local Lake Wales, Florida newspaper noting the dedication of a gun by the Daughters of the American Revolution. 2 guns mounted in the Maumee River National Park as companion pieces to a statue of Oliver Hazard Perry. 1 gun obtained by Galion Mayor Wilbur M. King in 1934. It was moved to the Galion Reservoir Park entrance in Crawford County and dedicated on October 15, 1967. 1 gun acquired in 1934 by the George Thomas Cullom Post, American Legion, and placed at Masonic College Park. 2 guns placed at Veterans Memorial Cemetery at Evergreen-Washelli in 1929. 1 gun presented to the City of Los Angeles by the Army and Navy Club Post No. 294 American Legion July 4, 1935. The gun is located in Pershing Square, Los Angeles, which is overseen by the Los Angeles Conservancy. 1 gun in the Charlestown Navy Yard. 2 were sold on Boston Common by Revere Legionnaires in 1942 as part of a WWII scrap metal drive. The current existence of the latter 2 guns is unknown. 1 gun at the Scrap Yard. This gun is shown in a photo published in the April 6, 1942 issue of Life magazine. It was purchased for $50 at the same WWII scrap metal drive. 1 gun given to the City of Medford and transferred to Tufts University in 1957. 2 guns located outside the Belmont Lions Club. 1 gun at Fort Independence on Castle Island. 1 gun at the Gethsemane Cemetery, placed there in 1932 in honor of Civil War Camp Andrews. 1 gun located on the Cole Parkway side of the Scituate Federal Savings Bank. Photo courtesy of Peter McPherson, an employee of Naval History & Heritage Command Detachment Boston. He read our blog post, which noted the possibility of a gun in an unknown location in Scituate. The post prompted McPherson to find this gun and verify that it was indeed from USS Constitution! 1 gun missing as of 1940. 2 guns at Stage Fort Park. 1 gun presented to the Sandy Bay Historical Society and dedicated on August 20, 1931. Today, it is located on the Community House lawn at 58 Broadway.